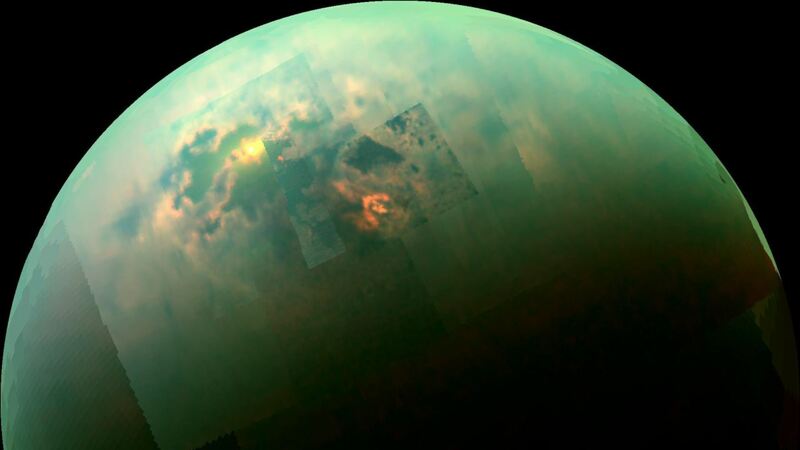 The brouhaha started when Nasa announced that its Cassini spacecraft was "monitoring the evolution of a mysterious feature in a large hydrocarbon sea on Saturn's moon Titan. The feature covers an area of about 100 square miles (260 square kilometers) in Ligeia Mare, one of the largest seas on Titan"
And that's not the only mysterious thing about it. Nasa says that this is the second time that Cassini has spotted the 'feature' in Titan's sea. It had disappeared for a while, but was now back. And what is even weirder, is that it has changed. In another more detailed report released along with the images, Nasa says that "In the images, the dark areas represent the sea, which is thought to be composed of mostly methane and ethane. Most of the bright areas represent land surface above or just beneath the water line. The mysterious bright feature appears off the coast below center in the middle and right images." There is still no clarity on what the bright spots are, but scientists are exploring possibilities like surface waves, rising bubbles, floating solids, solids suspended just below the surface, or perhaps something more exotic. @CassiniSaturn It's the Loch Ness monster! @DRUDGE_REPORT Riley Martin says its the Biavians winter retreat.